Selborne Golf Estate, Hotel & Spa - Pennington Accommodation. Enjoy pure indulgence at our spa, with more than 30 luxurious therapies available - from classic to contemporary massages, facial therapies and nail treatments. Our most prominent feature and prized offering is our world-class 18-hole, par 72 golf course. The course has been masterfully crafted to offer a challenging round, while golfers can take in unhindered sea vistas at nearly every hole of this exemplary course. Its beauty has been compared to that of Augusta, and the challenges that may be found here have been the downfall of many players during the Sunshine Tour. Designed by Denis Barker, one of the original proprietors of Selborne Golf Estate, Hotel and Spa, and recently revamped, the challenge is on from the first tee onwards, providing a real contest for golfers of every ability. Water is a prominent feature on the majority of the holes. The driving range is superb, and sits alongside Africa's biggest putting green with a resident pro on hand to offer advice and guidance.The tropical climate of the South Coast is perfect for year-round golfing experiences, and the area is also known as South Africa's Golf Coast, with 11 of Golf Digest's top-100 courses in the area. Internet - WiFi is available in public areas and is free of charge. Parking - Free public parking is available on site (reservation is not needed). 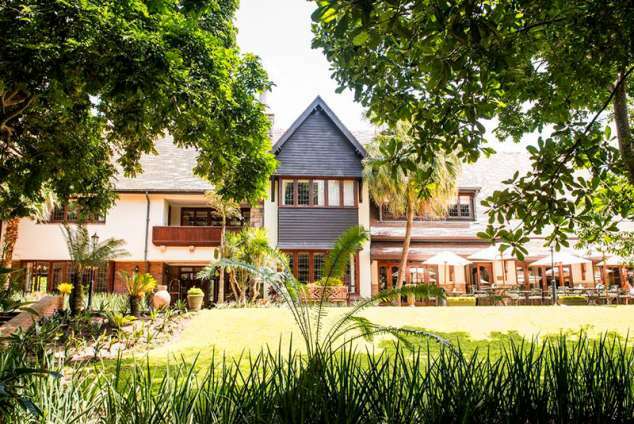 At Selborne Hotel we offer a range of delightful dining options, from the relaxed atmosphere of The Terrace, to the more formal elegance of The Lord Selborne Restaurant, and the convivial atmosphere of Barker's Bar. To book, call 039 688 1800. The Lord Selborne - The Lord Selborne Restaurant serves cuisine prepared with the freshest ingredients and served with a choice of South Africa’s finest wines. Our à la carte menu offers crisp, organic salads, the best cuts of steak and delicious seafood platters. The Terrace - The Terrace prepares a range of casual eats, including favourites such as burgers and wraps, in a relaxed family-friendly atmosphere.Match up your meal with freshly squeezed fruit juice, coffee or something special from our wine list. Barker's Bar - Barker's Bar's social atmosphere makes for the perfect end to a day well-spent in the lush surroundings of Selborne Hotel. Our wine cellar is a vault of premium South African wines hand-selected from the best that the Cape has to offer. In-Room Dining - Feel like staying in? Our beautifully appointed rooms make an ideal setting for a light snack or quiet evening meal ordered from The Terrace menu.The Garden Rooms, Garden Suites and Fairway Suites all have garden tables looking out over the gardens or golf course. Banish your everyday routine out of your mind with a day of indulgence at our onsite La Vita Spa, which is fully equipped with a sauna, express gym and four private treatment lounges. Treat yourself and a loved one to our truly rapturous La Vita spa therapies such as exotic facials, Swiss body wraps and non-surgical facelifts in the capable hands of welcoming and highly professional staff. Our spa is open 7 days a week, from 8am to 10pm. The beautifully restored Selborne Golf Estate, Hotel and Spa is the perfect location for an unforgettable wedding celebration with a grandeur of a former era. Situated in Pennington, on the South Coast, 45 minutes from Durban, the estate offers an unmatched wedding location as well as a championship golf course, world-class wellness spa, fine and casual dining, piano lounge and elegant bar, vintage wine collection, quaint chapel, premium accommodation, landscaped tropical gardens, beach house, outdoor sparkling pool and tennis courts. No matter what you're up to - Selborne Golf Estate, Hotel and Spa, in Pennington on the South Coast, offers the ultimate location with the widest array of conferencing and banqueting. 896 page views since 24 Jul, 2018. Last updated on 21 Jan, 2019.